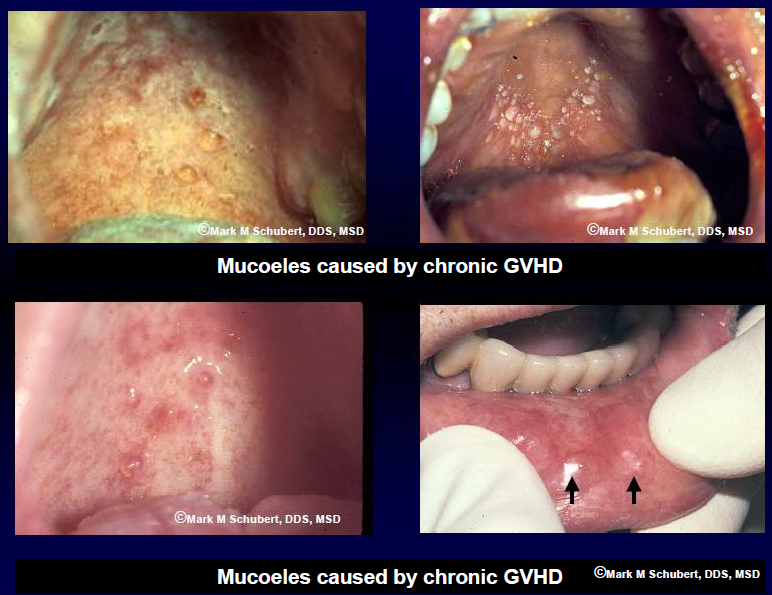 It is important to differentiate cGVHD from other conditions which may mimic it, including infections and other ulcerative conditions. Any mouth sores or ulcers – using analgesics or unable to eat? Any pain with spicy foods, fizzy drinks, hot/cold, toothpaste? Does you mouth feel dry most of the time? Do mouth symptoms limit your oral intake? A - Normal mucosa has the approximate colour of uncooked lean pork. B - Mild erythema appears similar to the inner part of an almost ripe strawberry. Moving outwards, the more intense the colour of the skin approximates moderate erythema. 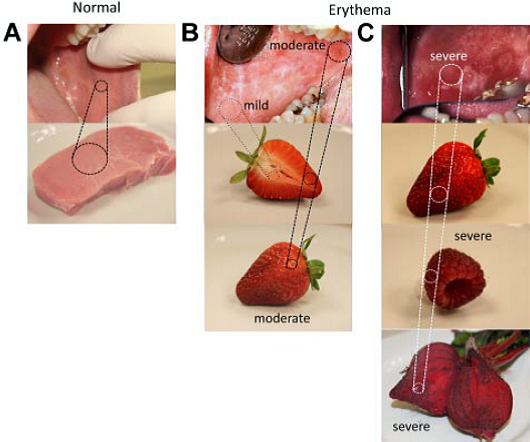 C - Severe erythema is most often the colour of a fully ripened strawberry, raspberry, or red beet. From Carpenter, P. A. (2011). "How I conduct a comprehensive chronic graft-versus-host disease assessment." Blood 118(10): 2679-2687. 1 - Mild symptoms with disease signs but not limiting oral intake significantly. 2 - Moderate symptoms with disease signs and partial limitation of roal intake. 3 - Severe symptoms with diesase signs and major limitation of oral intake. For more comprehensive assessment of oral GVHD and response to treatment, use the more detailed NIH scoring system (0-15). 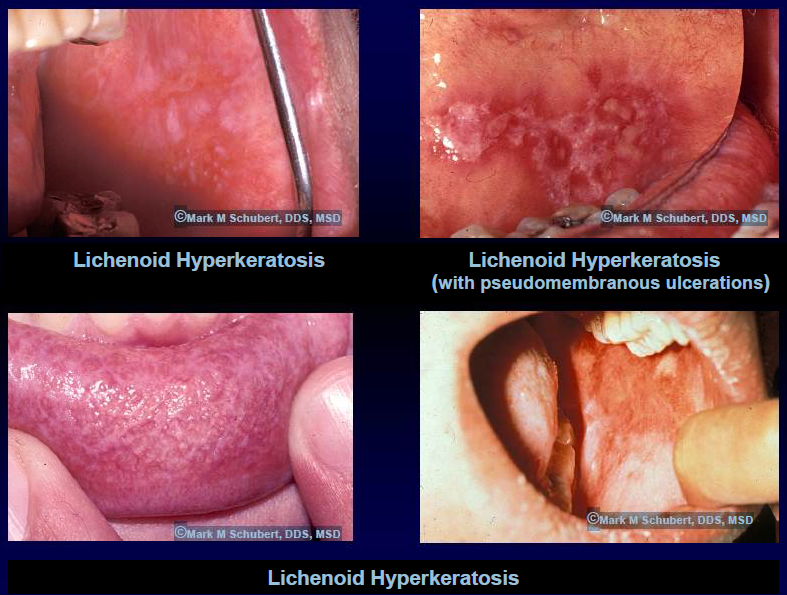 Left and right buccal mucosa – 20% each. Lips and lower labial mucosa – 20%. Soft palate and ventrolateral tongue – 20%. The hard palate and gums are inspected but do not contribute to the assessment of area. 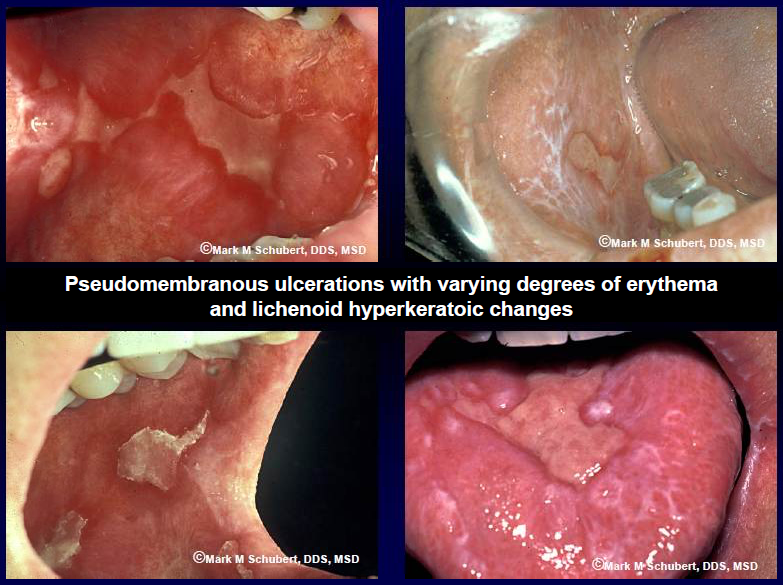 Swab erythematous lesions for fungal disease. Swab ulceration for HSV infection. Alcohol-free mouthwashes, e.g. “Colgate Dry Mouth Relief”, “Biotene” mouthwash, or “Oral 7”. Prescribe dry mouth products for symptomatic relief (these are available online, e.g. www.toothshop.co.nz). Recaldent gum for saliva stimulation (only effective if some residual function). OraLube 125 mls, 2 sprays as required (prescribable). Avoid xerogenic medications if possible, e.g. some antidepressants, antihistamines. Cholinergic agonists, e.g. pilocarpine eye drops 4% (40 mg/ml; 15 mls) 5 mg QDS. A local chemist may be able to make it up to 1 mg/ml solution. Will only work if some residual salivary gland function so stop if no benefit after 2 weeks. Contra-indicated in glaucoma, ischaemic heart disease, and COPD. Diprosone OV ointment 0.05% (30 g) - Twice daily, apply to gauze and leave in place for 10-15 minutes for localised lesions or triamcinolone 0.1% dental paste. Nystatin100,000 u/ml, 5 mls - Rinse and swallow QDS with topical steroids to prevent candidiasis. Topical cyclosporin, oral liquid preparation 100 mg/ml - Dilute 1 ml in 20 mls water in a glass container, rinse for 3-4 minutes and spit. Consider proton pump inhibitor, e.g. omeprazole 20 mg BD to control GORD. Annual review for secondary cancer screening – Refer to dental department. Carpenter, P. A., et al. (2015). "National Institutes of Health Consensus Development Project on Criteria for Clinical Trials in Chronic Graft-versus-Host Disease: V. The 2014 Ancillary Therapy and Supportive Care Working Group Report." Biology of Blood and Marrow Transplant 21(7): 1167-1187. Mays, J. W., et al. (2013). "Oral chronic graft-versus-host disease: current pathogenesis, therapy, and research." Oral Dis 19(4): 327-346.